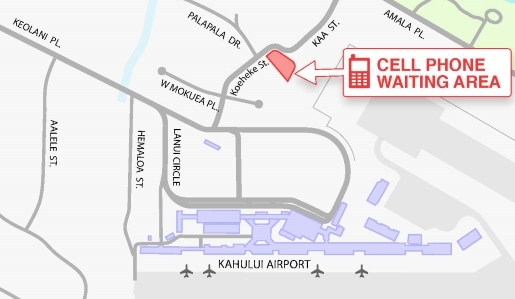 Drivers, who are picking up arriving passengers, may choose to stand by in the Cell Phone Waiting Area which is located just North of the car rental area, just a few minutes away from the airport terminal. The lot is open from 5 a.m. to 1 a.m. daily, and users will be allowed to wait up to an hour on the property. When your passengers have retrieved their luggage and are waiting at the curb they can call you on your cell phone and you may proceed directly to curbside pickup. This will keep you from having to drive around and around the terminal while waiting for them. The Cell Phone Waiting Area is a first-come, first-served lot. There is a maximum waiting time of 60 minutes. The driver must stay inside their vehicle while waiting. Unattended vehicles will be cited and towed. No commercial vehicles are permitted. Head southwest on Hana Hwy. Turn left onto Haleakala Hwy. Turn left on Keolani Place. Immediately past Palapala Drive, the Cell Lot driveway will be on the right. Head West on Hana Highway. Turn right on Dairy Road and continue onto Keolani Place. Open from 5 a.m. until 1 a.m.
Unattended vehicles will be cited and towed.